Jan. 27, Jan. 28 and Feb. 1 mark painful anniversaries for the human spaceflight community. Those are the days when terrible accidents claimed the lives of the astronauts of Apollo 1, Challenger 51-L, and Columbia 107. 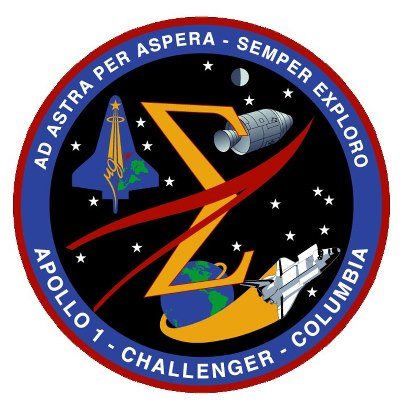 A memorial patch was created by scenic/graphic designer Michael Okuda, who has worked extensively with NASA as well as the “Star Trek” franchise, and ground control officer William Foster. It features images of the two shuttles and the Apollo spacecraft with stars representing the 17 lives lost. This emblem hangs on the wall of Mission Control in Houston, next to the mission patches for the three crews. On Jan. 27, 1967, astronauts Virgil Grissom, Ed White and Roger Chaffee died when fire swept through the Apollo 1 command module during a rehearsal for their mission, which was scheduled for Feb. 21. On Jan. 28, 1986, the Challenger was destroyed in an explosion about 73 seconds after liftoff. The crew consisted of Francis Scobee, Michael Smith, Ellison Onizuka, Ronald McNair, Judith Resnik, Gregory Jarvis, and Christa McAuliffe (from the Teacher in Space program). On Feb. 1, 2003, the Columbia, which had been launched on Jan. 16, was destroyed during re-entry. The crew consisted of Rick Husband, William McCool, David Brown, Kalpana Chawla, Michael Anderson, Laurel Clark and Ilan Ramon. This year’s observance is on Feb. 1. For more information, visit www.nasa.gov. To purchase the patch, click here. To visit Michael and Denise Okuda on Facebook, click here.